I never got around to writing about the legendary Swede Sven, who accidentally invented ice fishing in 1888. As the story goes: Sven's little log cabin shack slipped from the banks of Lake Minnewashta during an ice and rain storm and settled onto the frozen lake surface in the winter of 88. Sven, being an opportunist recognized the efficiency of this situation, and took up winter residence right there on the spot. Soon Sven discovered that there was no need to even wander from his shack to fish, he yust cut a hole in the floor and sat back and fished. So it went. 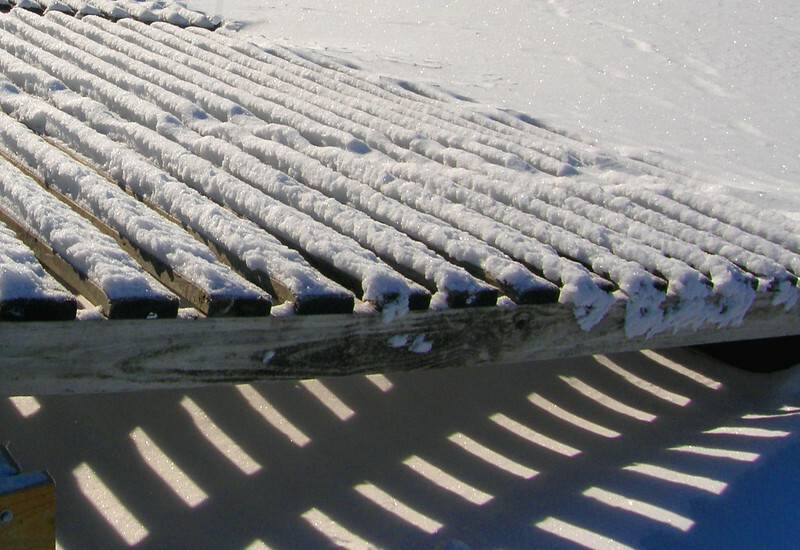 The short, unlucky month of February slipped away to the occasionl rumble of my snowblower. Now comes "March". They call it that for a reason. The ice houses must go - "Now March!" 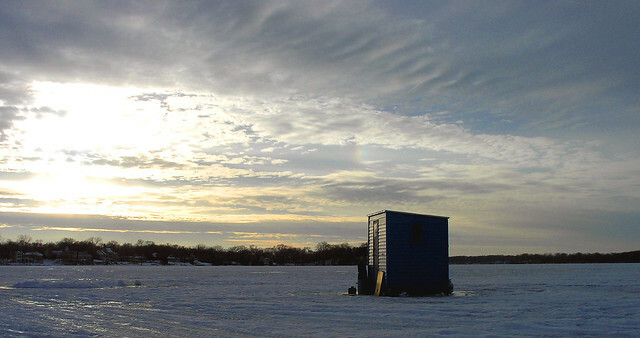 From The DNR: "Minnesota’s ice fishing shelter removal dates are approaching, and dark houses, fish houses and portables must be off Lake Minnetonka no later than midnight on March 4. Enforcement action will be taken if shelters are left after the deadlines. Those not removing shelters will be prosecuted. Conservation officers may remove the structure and confiscate or destroy it. It is also unlawful to store or leave a shelter at a public access." 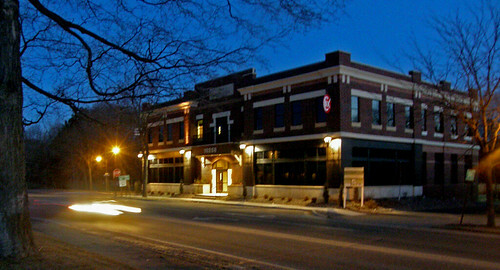 Leopolds in Excelsior is Gift shop/Bookstore and museum of Excelsior memories. I squeeze myself through the aisles. 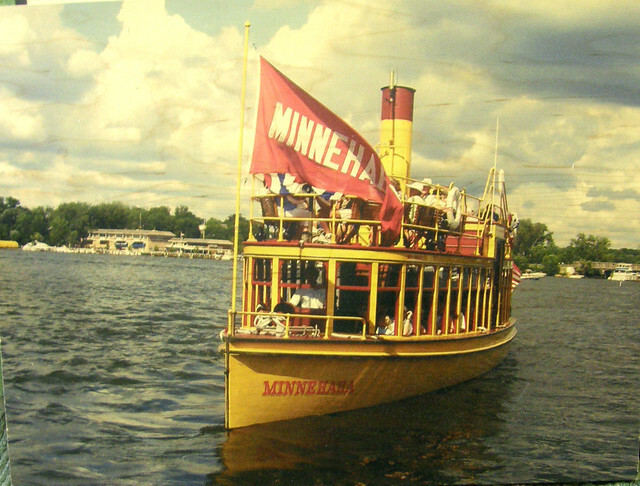 I page through vintage volumes on Lake Minnetonka, Farming, sailing, defunct railroads and how to train a unicorn. Dog books, 1940s Better Crocker Cook books. I take pictures, much to the consternation of the resident cat, who wanders through the shop and inspects each visitor. Big Reggies Danceland located across from today's Maynards Restaurant. 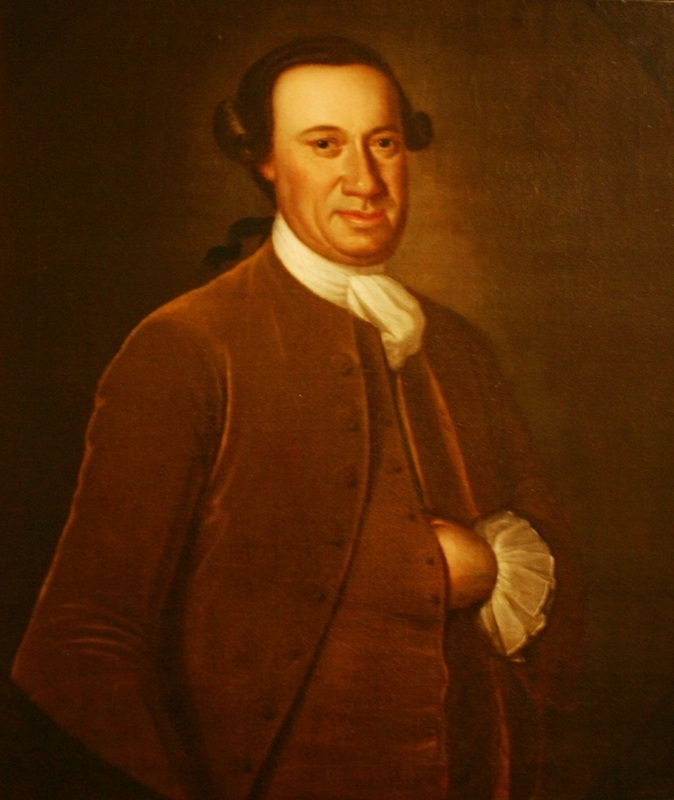 I couldn't resist this all but forgotten part of American History: "As the first President, John Hanson had quite the shoes to fill. His actions in office would set precedent for all future Presidents. He took office just as the Revolutionary War ended. Almost immediately, the troops demanded to be paid. As would be expected after any long war, there were no funds to meet the salaries. As a result, the soldiers threatened to overthrow the new government and put Washington on the throne as a monarch. All the members of Congress ran for their lives, leaving Hanson running the government. He somehow managed to calm the troops and hold the country together. If he had failed, the government would have fallen almost immediately and everyone would have been bowing to King Washington. Hanson, as President, ordered all foreign troops off American soil, as well as the removal of all foreign flags. This was quite a feat, considering the fact that so many European countries had a stake in the United States since the days following Columbus. Hanson established the Great Seal of the United States, which all Presidents have since been required to use on all official documents. President Hanson also established the first Treasury Department, the first Secretary of War, and the first Foreign Affairs Department. Lastly, he declared that the fourth Thursday of every November was to be Thanksgiving Day, which is still true today. The Articles of Confederation only allowed a President to serve a one-year term during any three-year period, so Hanson actually accomplished quite a bit in such little time. He served in that office from November 5, 1781 until November 3, 1782. He was the first President to serve a full term after the full ratification of the Articles of Confederation – and like so many of the Southern and New England Founders, he was strongly opposed to the Constitution when it was first discussed. He remained a confirmed anti-federalist until his untimely death." 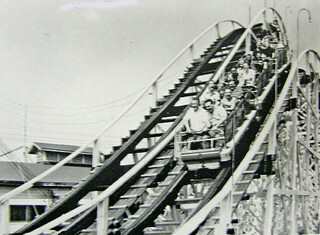 Morgan's youth). This intro from his bio: "Garrett Morgan is one of those rare people who are able to come up with an extraordinary inventions which have a tremendous impact on society - and then follows that up with even more! 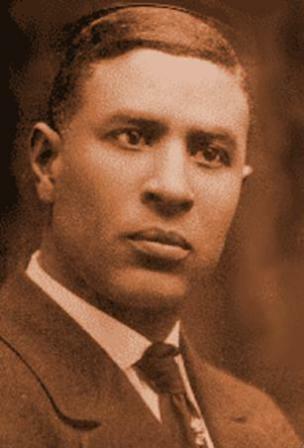 Garrett Morgan was born on March 4, 1877 in Paris, Kentucky the seventh of 11 children born to Sydney and Elizabeth Morgan. Garrett, at the early age of 14 decided that he should travel north to Ohio in order to receive a better education." And later in the article about Garrett it continues: "One day he witnessed a traffic accident when an automobile collided with a horse and carriage. The driver of the automobile was knocked unconscious and the horse had to be destroyed. He set out to develop a means of automatically directing traffic without the need of a policeman or worker present. 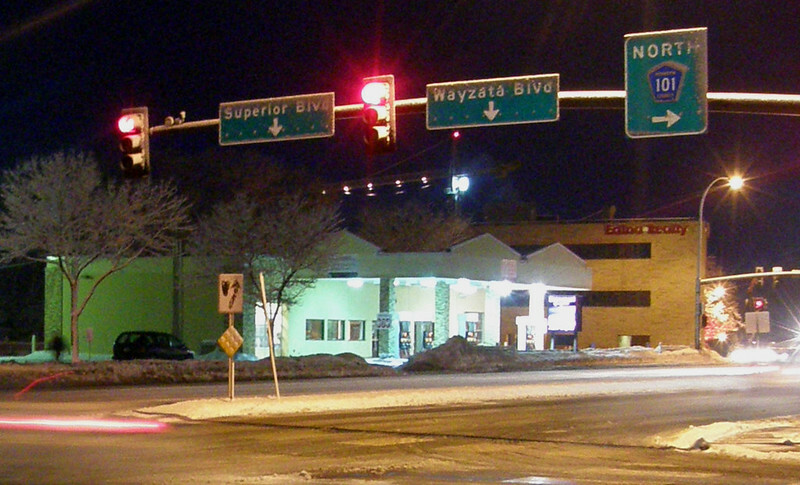 He patented an automatic traffic signal which he said could be "operated for directing the flow of traffic" and providing a clear and unambiguous "visible indicator." 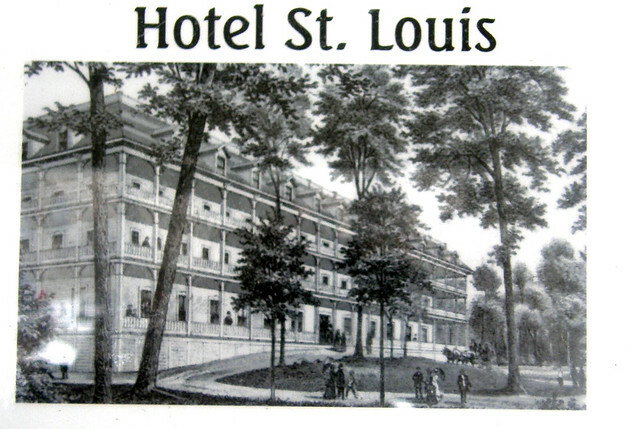 Satisfied with his efforts, Morgan sold the rights to his device to the General Electric Company for the astounding sum of $40,000.00 and it became the standard across the country. 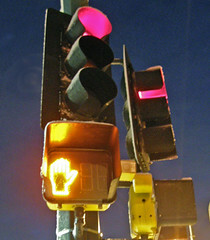 Today's modern traffic lights are based upon Morgan's original design." Most of us have experienced it, overcome it. It is a growth experience. Let's celebrate it. Better to have loved and lost. In the end you still have a sugar cookie. Concrete and Low Rise Construction. I was reading a trade magazine and I realised that I really did not know what “Low Rise” Construction is. Opposite of “Hi Rise”, I thought. I knew Low Rise was touted as green, sustainable, smaller cabon footprint, commonly made of alternate materials for envronmental reasons. But what is it Low Rise technically? I thought of Deephaven One. “A low-rise is any building that can technincally be constructed of sticks and bricks - which is usually no more than four stories, five if you have metal studs. A mid rise is defined as any building, the floor of whose upper-most level does not exceed 70’ or 75’ (I think it is seventy). Which is generally no more then eight stories. Cut my hair. I am not Samson. Oh, yes. I got a haircut at a local Great Clips. 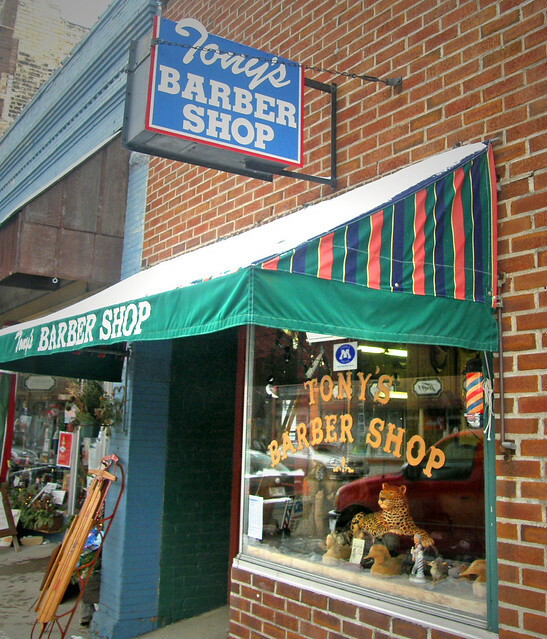 Not the cauacphony of animalia and clipper oil that populate Tony’s of Exceslior (pictured). Great Clips is a frachise, fencing with Pro-Cuts, a new scissors on the block just across the street. I only waited a minute to have my hair taken down with a number 2 and a scissors. My stylist was detatched. Her attempts at small talk were forced and feable and in my case unnecessary. But she did the job, and I paid the bill with a healthy tip. 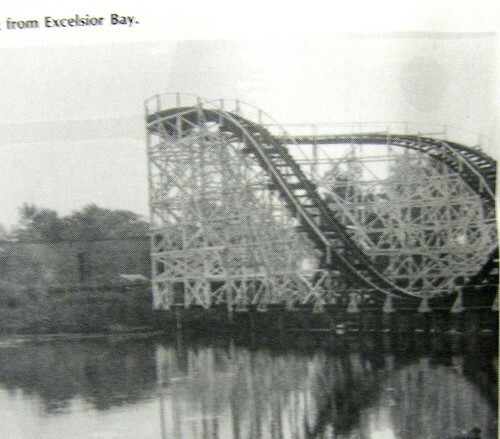 I slid on my posterior down the icy steps leading to the seasonally abandoned Kiosk at the Port of Excelsior. I would have made quite a sight, but the streets were quiet, Superbowl Festivities had emptied Water Street of witnesses. I gingerly approached the Kiosk to see what was posted inside. 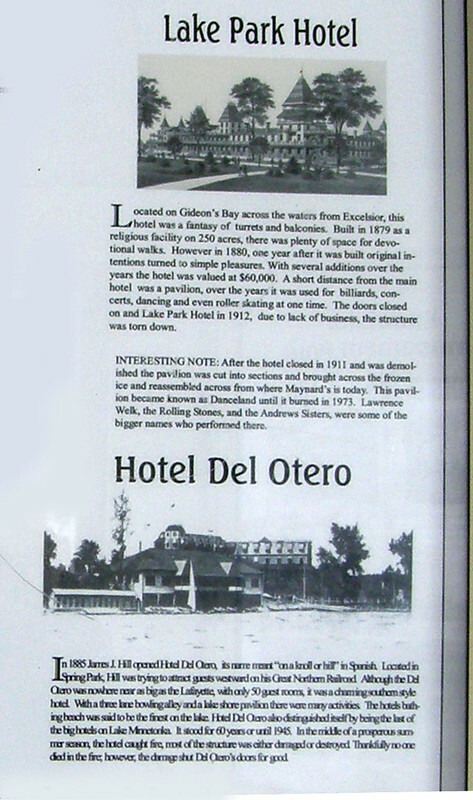 I found a series of articles about the Golden Days of Lake Minnetoka when the shores were lined with Grand Hotels, Steam Boats and the latest amenities. Excelsior is considering allowing the construction of a small hotel across the street from this site. 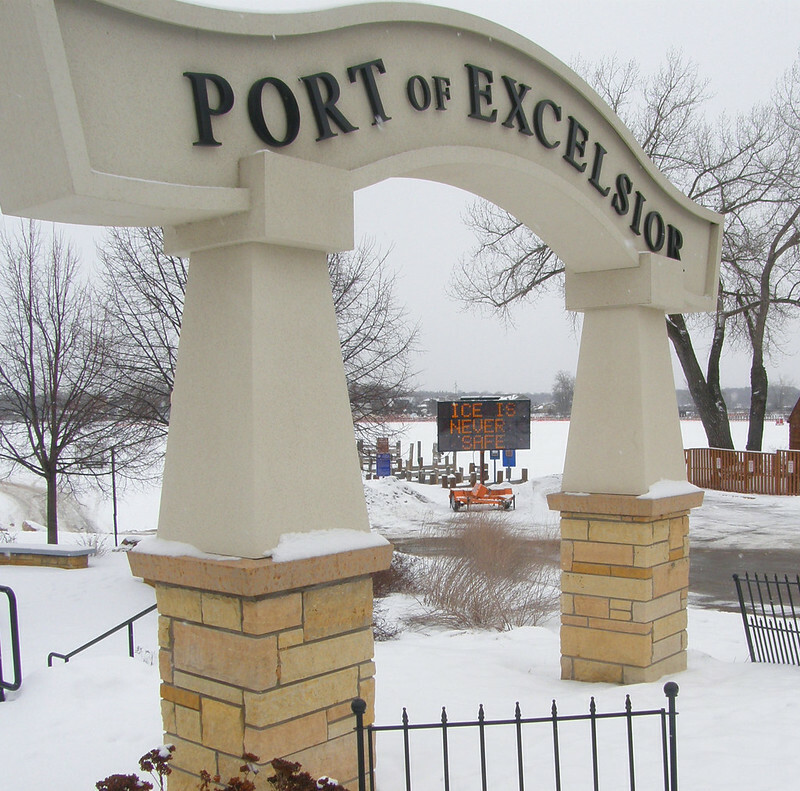 Done properly, with the residents agreement, I believe it would be a great addition to Excelsior. 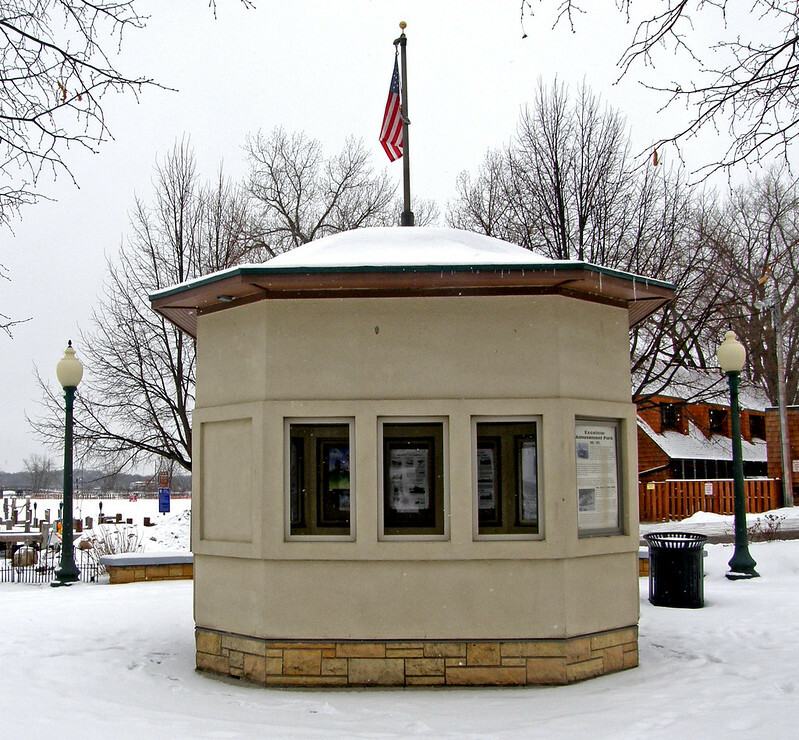 The lonely Kiosk. 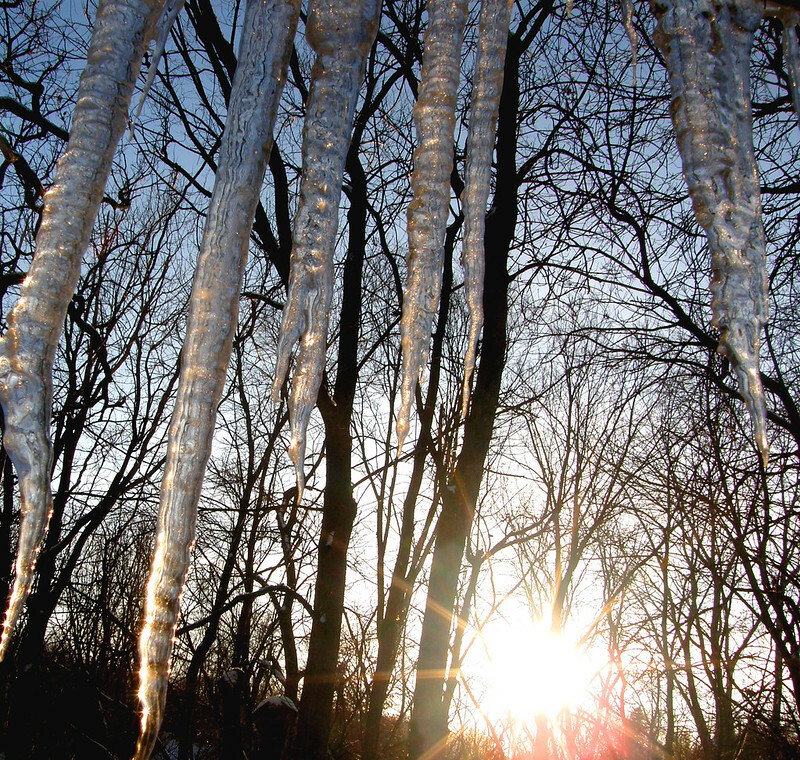 14 vehicles had fallen through the ice this "year". I assume this means this season. 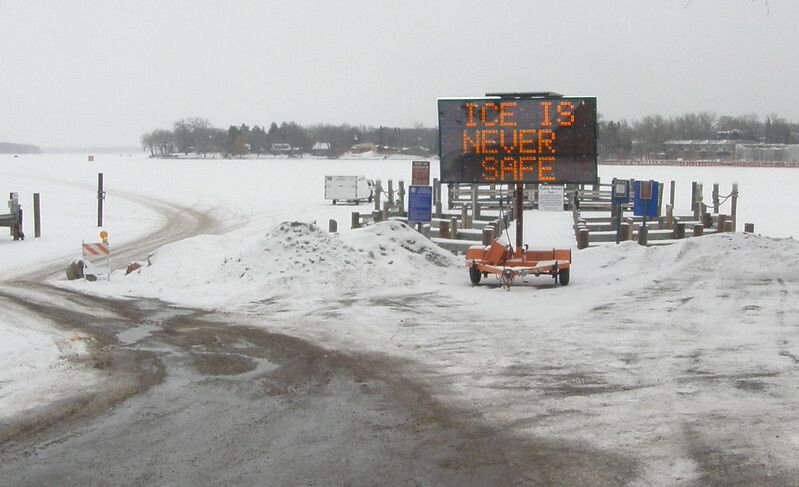 Led signs alert drivers, ICE IS NEVER SAFE.